Don't miss out on amazing deals and steals! Sign up for our SBC Newsletter to receive specials and price drops. 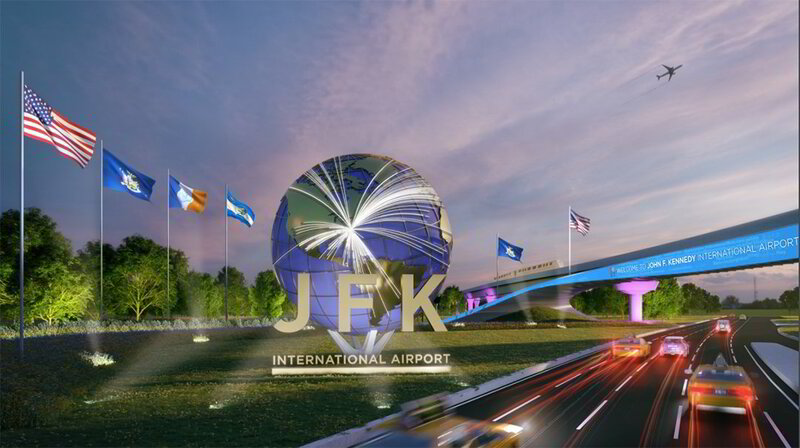 John F. Kennedy International Airport colloquially referred to as Kennedy Airport, JFK Airport, New York-JFK, or simply JFK or Kennedy and is the primary international airport serving New York City. It is the busiest international air passenger gateway into North America, the 22nd-busiest airport in the world, the sixth-busiest airport in the United States, and the busiest airport in the New York airport system; it handled just over 59 million passengers in 2017. Over ninety airlines operate from the airport, with nonstop or direct flights to destinations in all six inhabited continents. JFK is located in the neighborhood of Jamaica in the New York City borough of Queens, 16 miles (30 km) southeast of Midtown Manhattan. The airport features six passenger terminals and four runways. It serves as a hub for both American Airlines and Delta Air Lines, and it is the primary operating base for JetBlue Airways. JFK was also formerly a hub for Pan Am, TWA, Eastern, National, and Tower Air. Opened as New York International Airport in 1948, it was commonly known as Idlewild Airport before being renamed in 1963 as a tribute to John F. Kennedy, the 35th President of the United States, following his assassination. 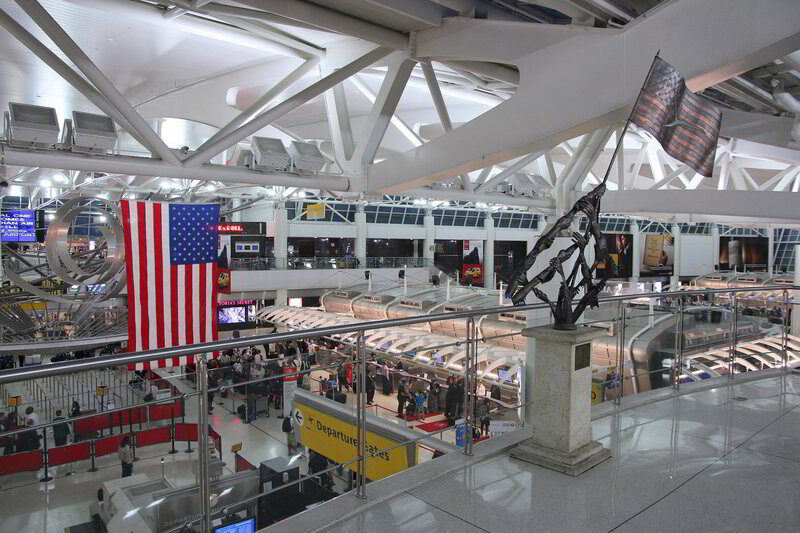 JFK has six terminals, containing 128 gates, numbered 1–8 but skipping terminals 3 and 6. The terminal buildings, with the exception of the former Tower Air terminal, are arranged in a deformed U-shaped wavy pattern around a central area containing parking, a power plant and other airport facilities. The terminals are connected by the AirTrain system and access roads. Directional signage throughout the terminals was designed by Paul Mijksenaar. A 2006 survey by J.D. Power and Associates in conjunction with Aviation Week found JFK ranked second in overall traveler satisfaction among large airports in the United States, behind McCarran International Airport, which serves the Las Vegas metropolitan area. Until the early 1990s, each terminal was known by the primary airline that served it, except for Terminal 4, which was known as the International Arrivals Building. In the early 1990s, all of the terminals were given numbers except for the Tower Air terminal, which sat outside the Central Terminals area and was not numbered. Like in the other airports controlled by the Port Authority, terminals are sometimes managed and maintained by independent terminal operators. At JFK, all terminals are currently managed by airlines or consortiums of the airlines serving them, with the exception of the Schiphol Group-operated Terminal 4. All terminals except Terminal 2 can handle international arrivals that are not pre-cleared. Most inter-terminal connections require passengers to exit security, then walk, use a shuttle-bus or using the AirTrain JFK to get to the other terminal, then re-clear security. SimplyBusinessClass.com can save you up to 50% off your business class flights out of New York John F. Kennedy International Airport. Call now or submit our flight request form to receive a free quote.